Each job type takes a unique approach to shaping the future of medical services. Health care administration governs the operations of a health or medical service. Those in health care administration roles are usually assigned a specific level of service coordination. This could be as large as an entire medical facility or as small as a specific department of clinical methodology. Health care administrators are leaders in the industry due to their management of facility and service operations. As such, it’s imperative that they be able to adapt to the industry’s frequent legal, regulatory, and tech-driven changes. Additionally, they must have the leadership skills needed to encourage and motivate staff members to embrace these changes. In some cases, they may be involved in the recruitment, hiring, and training of new staff members. Ultimately, they utilize their coordination competency and leadership acumen to ensure that a facility delivers high-quality care to improve patient outcomes. 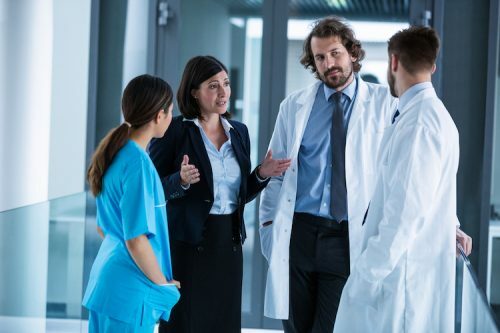 Professionals in these four types of health care administration jobs, from executive leadership to health care marketing, work to ensure patient health. Executive health care administrators are senior-level officials who make critical decisions relating to a facility’s delivery of health care. Those in this role create and deploy various strategies to ensure a facility’s effectiveness. Executive health care administration comprises several high-level positions, such as chief operations officer, chief nursing officer, and hospital chief executive officer. Chief operations officers (COOs) typically oversee a facility’s daily activities and initiatives to ensure it is running smoothly. This usually includes managing a facility’s finances, a duty that can involve creating an organizational budget. According to PayScale, the average annual salary for a COO is $139,200. Chief nursing officers (CNOs) oversee and lead a facility’s nursing staff. They’re responsible for the development and maintenance of optimal nursing environments that ensure consistent quality, which can make patient care delivery more efficient. PayScale lists the average annual CNO salary at approximately $126,300. Hospital chief executive officers (CEOs) develop specific strategies to keep a health care organization competitive. They often interact with a facility’s board of directors to set guidelines that dictate how these strategies can be implemented. PayScale lists the average annual CEO salary at around $159,500. Health informatics allows tech-savvy health care professionals to merge their nursing and administrative skill set with a deep knowledge of tech-driven concepts and systems. It’s a rapidly growing field whose existence reaffirms the increasing presence of technology in a clinical environment. Health informatics specialists implement forms of health care-focused information technology in a clinical setting. They oversee the use of tech-driven health care tools and diagnostic systems among various clinical staffs, but they can also use the equipment to deliver patient care. PayScale lists the average annual salary for the position at around $85,700. Health information managers oversee various tech-driven health delivery systems to ensure they’re operating optimally. These professionals also typically manage, analyze, and interpret data that come from these systems to derive pertinent information that could translate to more efficient patient care metrics. According to PayScale, the average annual wage for this position is approximately $54,300. Health IT specialists create, develop, store, and support patient electronic health records (EHRs). They may also work with various health care teams to extrapolate a patient’s medical data in ways that could lead to more efficient means of care. This position is comparable to health informatics specialists and therefore can command a similar average salary. People in health care marketing and public relations roles devise various strategies to draw attention to their facilities and attract new patients. These ethics-driven strategies put the need to deliver high-quality patient care at the forefront, even if the end goal is to increase a facility’s profitability. Health care marketing managers create and execute various marketing campaigns that promote a facility’s brand awareness. These strategies can leverage traditional forms of media, such as television, radio, and billboards, as well as new marketing tools, such as social media platforms. This position typically falls under the broader category of marketing managers, who have an average annual salary of about $63,500, according to PayScale. Those involved in hospital PR and media relations create hospital-based programs that align with the public’s perceptions and attitudes regarding health care. They can work with various media outlets to help spread the word on these programs. For example, a hospital PR and media relations specialist may help bring a real case story to the attention of the public for the purpose of media relations, funding, or advertising. Their job would be to make sure the technical side of the doctor’s story balances with the patient’s side to give the audience a story that resonates. Hospital PR and media relations is all about connecting what the hospital does to the target audience and the public. This position is usually part of the broader category of PR managers, who have an average annual salary of about $64,700, per PayScale. Individuals in health care administration and management roles may oversee a specific component of health care delivery, such as assisted living facilities, hospitals, public health systems, or even health care networks. While these positions focus on different health care elements, they tend to hold similar duties. Some of their tasks can include employee recruitment, overseeing interdepartmental communication, and resource management. Salaries can vary depending on the type of facility being managed. For instance, PayScale lists the average annual salary for assisted living administrators at around $54,800, while it lists the average annual salary for hospital administrators at approximately $88,700. Whether a health informaticist with the goal of improving methods through technology and data or a health care marketing and public relations specialist with the aim of better connecting the hospital to the public, these jobs involving health care administration have one singular goal ― to provide better care for patients and improve their lives going forward. Jobs that fall under the health care administration umbrella are among some of the most satisfying positions in the industry, due to their shared mission of bettering people’s lives. Discover more about making a true difference today. The online Master of Health Administration program at Regis College prepares graduates for success in the growing job market for hospital administrators. If you are interested in becoming an effective, well-educated leader of a health care institution, Regis encourages you to learn more about the MHA degree program today.